Greeting Divas and Gents! I won't hold you long with this post, but there has been something on my spirit that I feel the need to release. Recently, I have encountered many instances of folks doing things that could have detrimental effects on their professional reputation. Things that I could not have imagined doing at any point in my career. Things that I would have hoped that common sense could have prevented. But here I am sitting at lunch writing this post because I am befuddled as to why one would make choices in the moment that have long-lasting effects. Whenever I see folks exhibiting this type of behavior, I remember something that my mentors have always said to me...the same something I am going to share with you all...because I share! 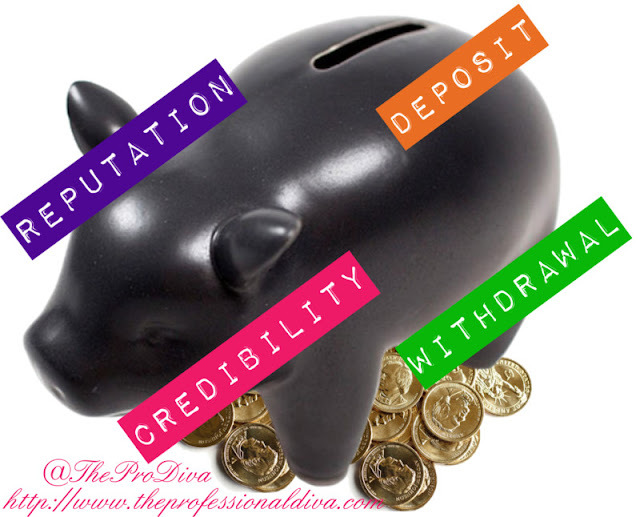 Over the course of your career, it is important to continuously make deposits into your credibility bank account. You do this by working hard, churning out excellent work product, and doing all of those things that lends itself to you being a great professional. You also earn credibility "dollars" by doing other things not directly related to your work product, like having an overall positive attitude, being a team player, and showing up to company-sponsored events and activities. All of these things build credibility and lends itself to a positive reputation. So for all of you professionals out there making it rain at the credibility bank, I urge you to keep up the good work...it takes time to build "wealth" in this area, so stay the course. I also caution you to withdraw from your account wisely. It's bound to happen at some point(s) in your career. Maybe you inadvertently missed a deadline. Or perhaps you showed up to a meeting late. Or not at all! The good thing about building credibility is that in doing so, you afford yourself the opportunity to make withdrawals when necessary. So imagine if throughout your career you fail to make any credibility deposits, and then find yourself in a position where you need to make a withdrawal. What happens then? Overdraft! Okay, maybe I'm getting a little out of hand with this metaphor, so let me bring reputation into this really quickly. When building credibility wealth, you inevitably develop a reputation for yourself. If you are being a stellar professional, you will have created a reputation as...a stellar professional. Small missteps won't kill your reputation if your credibility bank account is fat. But if your account is slim, you cannot afford to act up! In this instance your reputation is not that great, so you have insufficient funds to make a withdrawal. Similarly, continuously making withdrawals from your account is indicative of a declining reputation. So here is my message (and the reason for this post) to all of you professionals whose reputations are unfavorable and/or on the decline due to continuous withdrawals: do better! Also know that not all deposits and withdrawals are created equal. Your great work product may be good for a $100 deposit, but getting wasted and showing out at the company picnic will cost you about $80. It's just like Mr. Buffett said: "It takes 20 years to build a reputation and five minutes to ruin it." So please take the time to think before you behave in such a way that will drain your credibility account and tank your reputation. I hope all of this makes sense, and I hope that my sentiment was not loss. Let's talk about it!